With spring here and the flu season hopefully over, I look forward to good sunshine and warm weather. For people with allergies, I know spring can be as miserable as the flu season. My husband, who is an allergy sufferer, tells me at least with the common cold, it will pass within a week or two but with allergies, flare-ups can happen week after week depending on the allergens. I volunteer in my daughter's second grade class every week and at first, I thought a couple of the kids blowing their noses had allergies so I didn't take the usual precaution of keeping my hands away from my face and all those staying healthy stuff. Well, apparently, there is a bug going around with symptoms very similar to that of allergies. Well I got the bug last week and I could feel my ear acting up like an infection was coming on. When I felt some pain in the right ear and my right nose sinus acting up, I knew I had to act fast to stop the infection. 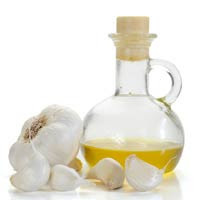 I had read some time ago an effective way to get rid of an ear infection was to use garlic oil. Garlic has many beneficial properties that inhibits bacterial, viral, and fungal growth. Garlic also has antiseptic and anti-inflammatory compounds. All of these benefits is what makes garlic so effective in getting rid of ear pain and ear infection. Olive oil is an old home remedy for ear infection but adding crushed garlic to olive oil makes the remedy much more effective. When my daughter was in kindergarten, she had her first ear infection. I crushed a clove of garlic and coarsely chopped it before letting it soak in olive oil for 30 minutes or so. I put just one drop of the garlic oil in her ear and had her lay down with the infected ear facing up. This helps keep the oil go down the ear. I also placed a warm towel over her ear until the towel started to loose the warmth. I did the warm compression for about 15 minutes. Within probably 30 minutes, the pain was gone. She was up and running. I didn't need to repeat a second time because the pain never came back. If you let the garlic soak longer, like overnight, it is better but with an ear infection, you want instant relief so you usually don't have time to let the garlic soak for too long. As for me, after I had my eldest daughter put a drop of garlic oil in my ear, I would say, the pain was gone in less than 30 minutes. Even though the pain was gone, I wanted to make sure I got rid of the infection completely so I added a second drop at night before I went to bed. I was blowing out yellow nasal discharge the next day so I knew I had a pretty bad infection. It's been 2 days and my nasal discharge is clear now and a lot less so I hope to be all better by the end of this week. Garlic oil is by far the best home ear infection remedy. It works fast and it is harmless unlike prescribed antibiotics that doctors give you for ear infections. Not only do antibiotics kill the bad bacteria, it also kills the good ones and you need the good ones to keep you healthy or to help you fight your current infection. It is not a good idea to pour cold garlic oil into your ear when you have an earache. I warmed up my garlic oil by running a spoon in hot sink water, dried it with a paper towel and immediately scoop a small amount of the garlic oil (make sure you don't pick up any garlic pieces!) swirl it around to warm it up and then pour the garlic oil in the ear right away. Note: Please make sure you use fresh olive oil and not old oil that has been sitting in the cabinet for a long time. You will be pouring the oil in your ear so it is always better to use new olive oil if you are unsure how fresh yours is and make sure you use a clean knife to crush the garlic. **If you earache is still persistent after the garlic oil treatment, you should go see a doctor.